I didn’t think I needed another ice cream book. I’ve got a solid collection with my previous favorites being David Lebovitz’s The Perfect Scoop and Jeni Britton Bauer’s Jeni’s Splendid Ice Creams at Home. But then I saw that Dana Cree, the longtime pastry chef at Blackbird and currently the executive pastry chef of The Publican restaurants in Chicago, had a new ice cream book out. And I had to buy it. Even though I get sent lots of review copies and have book shelves overflowing with cookbooks, I don’t regret the purchase. First of all, it’s beautifully designed with charming illustrations from Anna Posey integrated into photographs from Andrea D’Agosto (a friendly, welcoming incarnation of some of the Lucky Peach aesthetic). Secondly, while I’ve loved my homemade ice creams and sorbets, I’ve often been disappointed that they tend to get icy faster than commercial pints. Cree has a whole section demystifying stabilizers from commercial ice cream stabilizer to guar and xanthan gums to tapioca starch and corn starch. She explains what they’re made of and how they work and lets you decide which you want to use based on your tastes and dietary preferences in any of her recipes. I’d already started exchanging some of the sugar in many ice cream recipes for a bit of glucose or corn syrup (something Jeni Britton Bauer does in her ice cream books), but Cree uses glucose syrup more liberally (about twice as much as Bauer usually calls for). As a result of both the strategic use of stabilizers and the liberal use of glucose syrup, I’ve been able to make ice cream with the creamiest, smoothest texture ever to come out of my kitchen that have survived the freeze-and-thaw cycle of my standard freezer for weeks. Also, pretty much every flavor in the book feels like something I want to eat. I can’t wait to make her burnt honey ice cream or the salted creme fraiche caramel ice cream, the hibiscus frozen yogurt or the spice cane syrup frozen yogurt, and I’m kind of obsessed with the sherbet section. Sherbet is the in-between frozen treat. Unlike sorbet, it has dairy, but but it has far less dairy fat than ice cream. 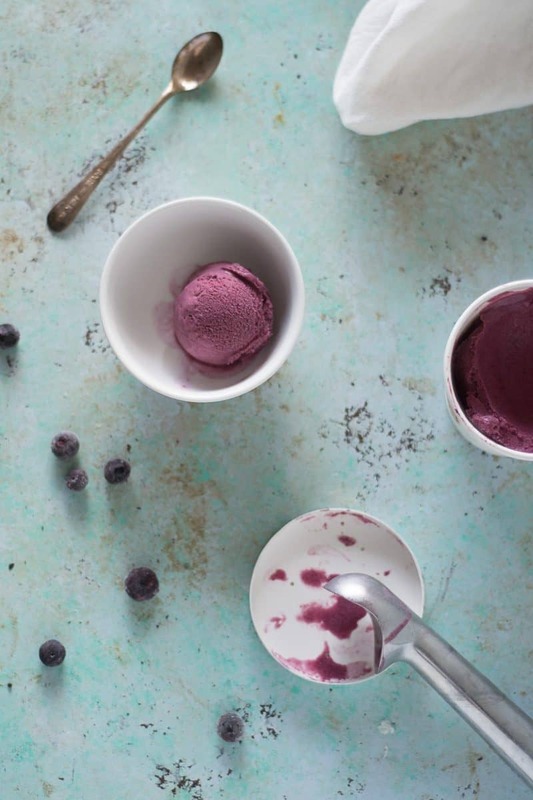 Since dairy fat can obscure fruit flavors, sherbets are a great place to use them if you want something a little richer than sorbet without the sometimes distracting tang of frozen yogurt. I’ve made and loved Cree’s strawberry sherbet and apricot rooibos sherbet, but right now I’m over the moon about a flavor I made up myself, blueberry sumac sherbet. 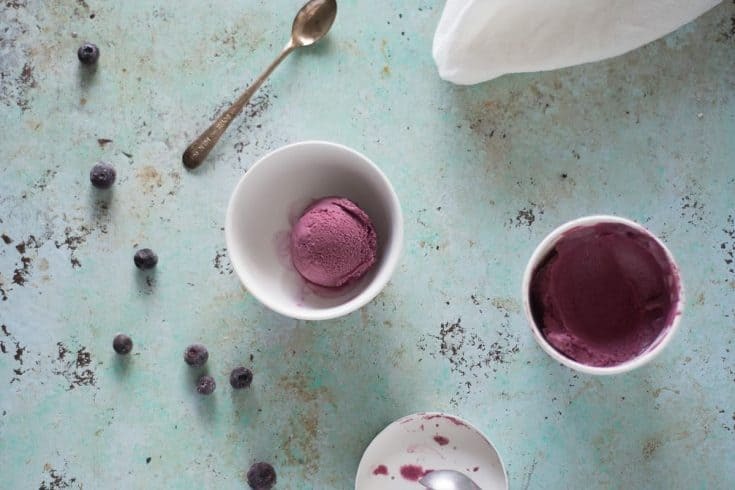 This blueberry sumac sherbet is fruity and creamy and pleasantly sour in a way you don’t often encounter in frozen desserts. You may know sumac from Middle Eastern cuisines or recognize its bright lemony flavor as one of the main components in a za’atar spice blend. It’s often used in savory dishes, but I think its puckery lemony tang goes beautifully with blueberries here. I use Cree’s blank slate sherbet recipe as a base, but bumped up the cream to slightly to prevent any curdling with the acidity of the sumac. I also swap in citric acid, which is easier to find and complements the lemony notes in sumac in a more pleasing way for me here than the malic acid (which comes from apples and pears) that she favors. 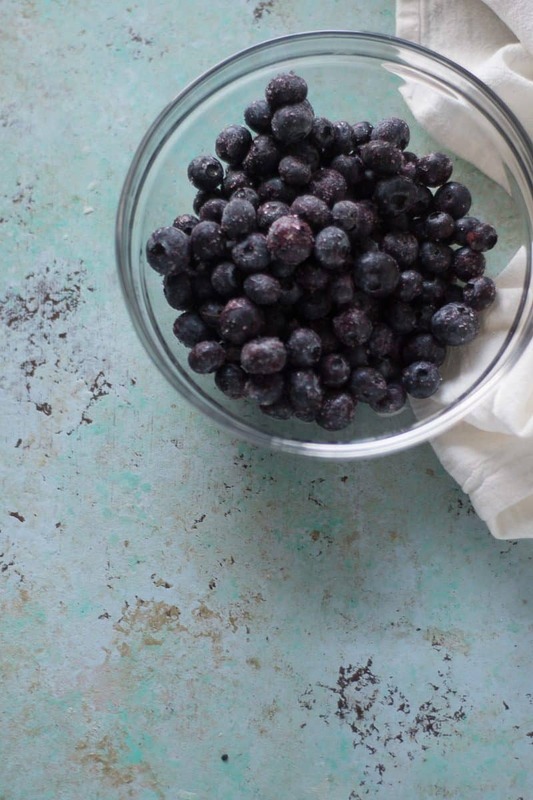 If you are in Chicago, you absolutely must treat yourself to some blueberries from Klug Farm, which are consistently the best blueberries I have ever had, and if you are not in Chicago you should look for the best local, in-season blueberries you can find for this. If you’re a fan of desserts with a sour kick, this one is for you. 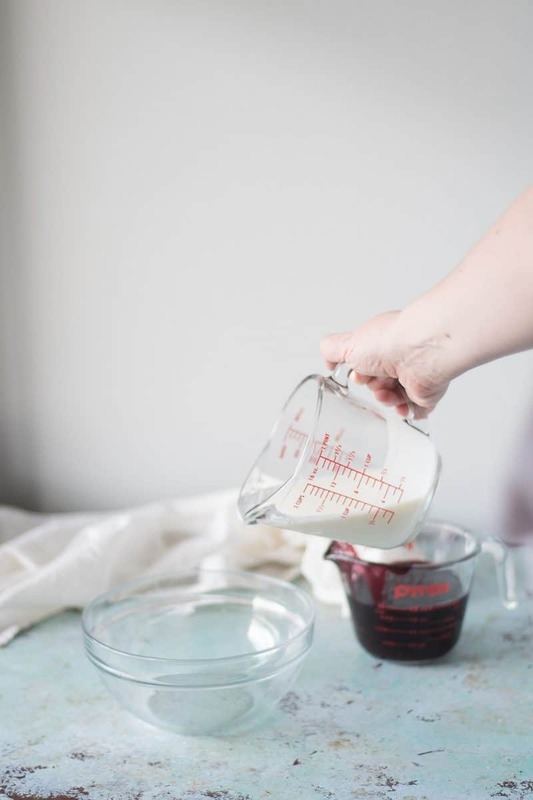 Mix the cup of blueberry puree with the buttermilk and citric acid in a small bowl and refrigerate. Mix the commercial ice cream stabilizer, if using, with the sugar. Put the milk, cream, sugar, and glucose or corn syrup in a heavy-bottomed sauce pan and over medium-high heat. Cook, whisking occasionally, until the mixture comes to a bowl. Reduce heat to low and simmer for 2 minutes. Remove from the heat. Add the sumac and let the mixture infuse for 30 minutes. Strain the infused mixture through a fine mesh strainer into a medium glass or metal bowl. Discard the sumac. Make an ice bath in a large bowl and nest the hot bowl into it and stir with a silicone spatula until the mixture is cool to the touch. Remove from the bowl from the ice bath (and dry off the bottom). Add the blueberry buttermilk mixture to the cooled dairy mixture and whisk until combined. 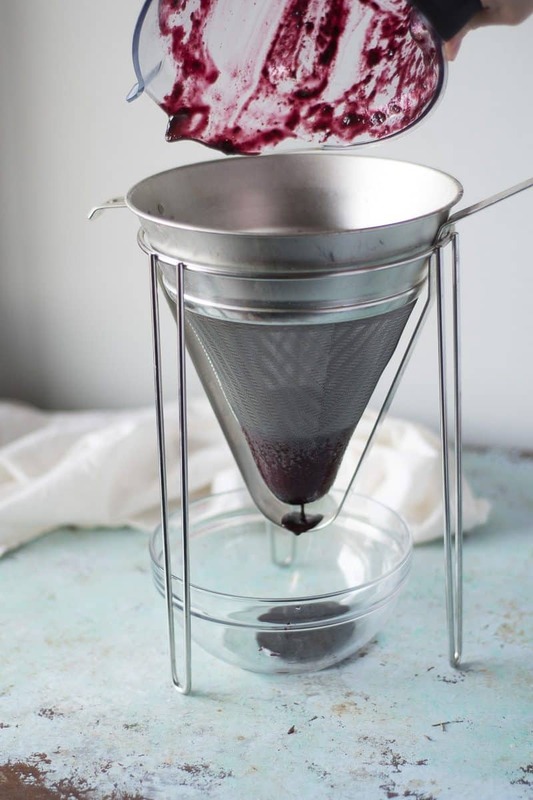 Strain through a fine mesh strainer, cover, and chill overnight (or for at least 4 hours). 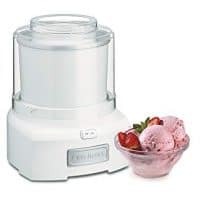 Churn according to your ice cream maker's instructions until the sherbet thickens to the texture of soft serve and has noticeably increased in volume. Usually about 20-30 minutes. If you want a soft serve texture, you can eat it now, but it will be better if you let it hang out in the freezer for a while. Transfer to an airtight container and store in the freezer until the sherbet has firmed up, at least 4 hours. If you love David and Jeni’s books then this one should be right up your alley! I didn’t know that add glucose or corn syrup to sherbet since it’s frozen. Looks absolutely delicious! The syrup really helps to keep it scoopable! I’m a big fan of sumac! I have a Moroccan spiced chicken thigh recipe on my blog that highlights the spice. It’s not very well known in the States! I love sumac in savory applications, too. Glad to have another fan of the spice! I think it’s getting more familiar here, which is good because it’s so delightful! 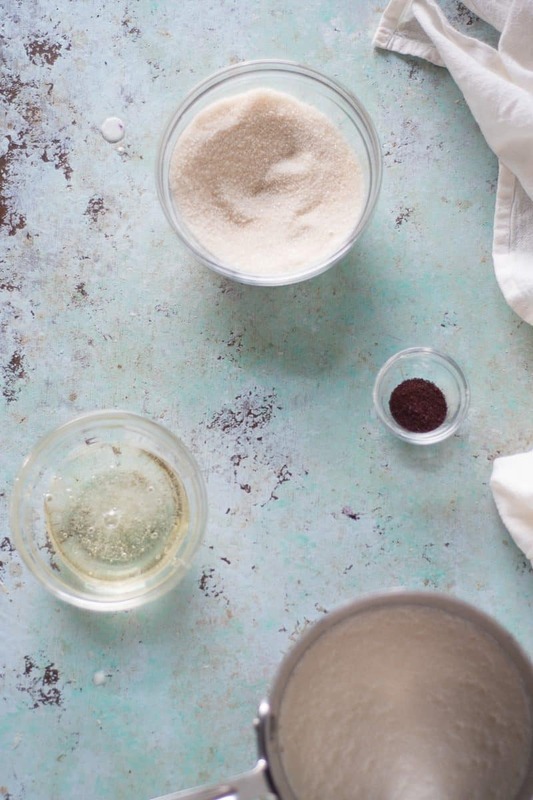 Never thought about using sumac with something sweet – especially ice cream. But this sounds amazing. Will have to give it a try! I usually think of it as a savory spice first, too, but I think it works really well here! What a delicious treat for the hot summer months! This sounds great and will be fun to make! Thanks for sharing! Can I use honey instead of corn syrup? Any other subs you would recommend? Thank you. I can’t wait to make this! The corn syrup or glucose syrup helps keep this soft and scoopable. I wouldn’t use honey because the flavor isn’t quite right for this and it’s quite a bit sweeter than corn syrup. You want a neutral sweetener here. I would just use additional sugar in place of the corn syrup/glucose syrup. The texture will be slightly icier but it will still be delicious.